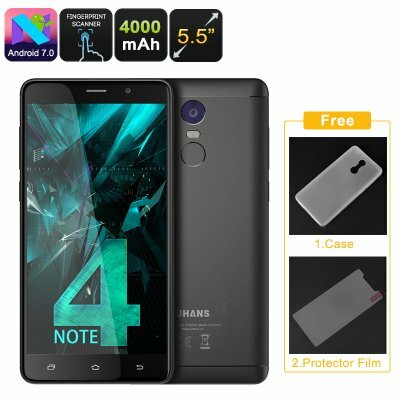 Successfully Added Uhans Note 4 Android Smartphone - Quad-Core, 3GB RAM, Android 7.0, 5.5-Inch, Dual-IMEI, 4G, 13MP Camera, 4000mAh (Black) to your Shopping Cart. The Uhans Note 4 is a remarkably cheap Android phone that, despite its low price, packs sophisticated hardware and software. It runs on an Android 7.0 operating system. This means that you’ll be able to smoothly run all the latest software features available for your mobile phone. Also, it comes packed with the MediaTek6737 processor. This Quad-Core CPU has been clocked at 1.25GHz and brings forth a great performance. Along with your phone’s 3GB RAM, you’ll be able to tackle demanding games, movies, and Apps alike. With its 4000mAh battery, your Android phone provides you to 8 hours of continuous usage time. Simply head out to the Play Store where you’ll be able to fill up the phone’s 32GB internal storage with all the media of your liking. For those of you that need even more, the Uhans Note 4 smartphone comes with a 128GB SD card slot. This Android phone offers plenty of storage for you to keep all your files, media, and pictures. Talking about pictures, this beautiful cell phone comes with a 13MP rear camera. This snapper lets you take breathtaking images and video. You’ll be able to watch back all the pictures you have taken on the phone’s stunning 5.5-Inch HD display. By featuring IPS technology, it is guaranteed to treat you to vivid color and sharp details no matter your viewing angle. Whether you use your phone for browsing the web, watching films, or playing games – you’ll always be treated to a crisp visual experience. The Uhans Note 4 smartphone comes with a 12 months warranty, brought to you by the leader in electronic devices as well as wholesale Android phones..